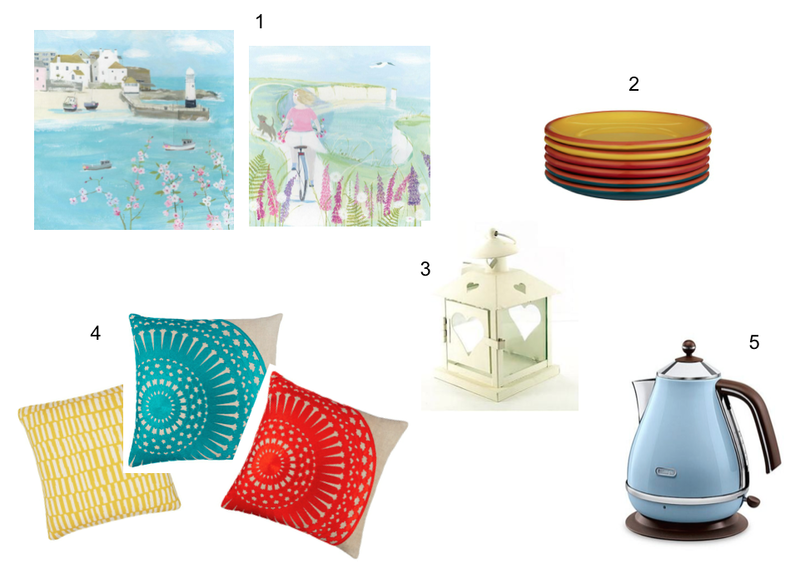 With the weather warming up our house could do with a few new items to get into the Summer spirit. Here's a few things on my wish list. 1. Seaside Prints. One of my favourite counties is Cornwall. I've been many times and love the beautiful beaches and rugged landscape. We celebrated Toddler's first birthday there last year. The prints here are by artist Hannah Cole and are on sale at the Whistlefish galleries which are dotted all over Cornwall. I look at these paintings and smile and would love some in our house. 2. Tableware. I have been looking for some plates and love the bright bold colours of these ones from John Lewis. They are part of the Al Fresco plate range that comes in a set of six. 3. Lantern. This small heart lantern from Hobbycraft would add a little sparkle to the house. I like the cute little hearts and could certainly find a lovely little spot to hang this from. 4. Cushions. Our cushions are pretty boring at the moment and I have been meaning to get some for the bedroom. I love the unique colours and designs in these cushions. The blue and red are part of the John Lewis Figeria Cushion range and the yellow is a MissPrint Home Dashes Cushion both available from John Lewis. 5. Kettle. Doesn't a nice looking kettle make such a big difference to a kitchen? The House of Fraser has a great selection of kettles. This one is the Delonghi Vintage Icona Blue Kettle and I like the unique colour and stylish look. This is a collaborative post with the House of Fraser. All words and opinions are my own. That's my Summer Wish List. What would be in yours? 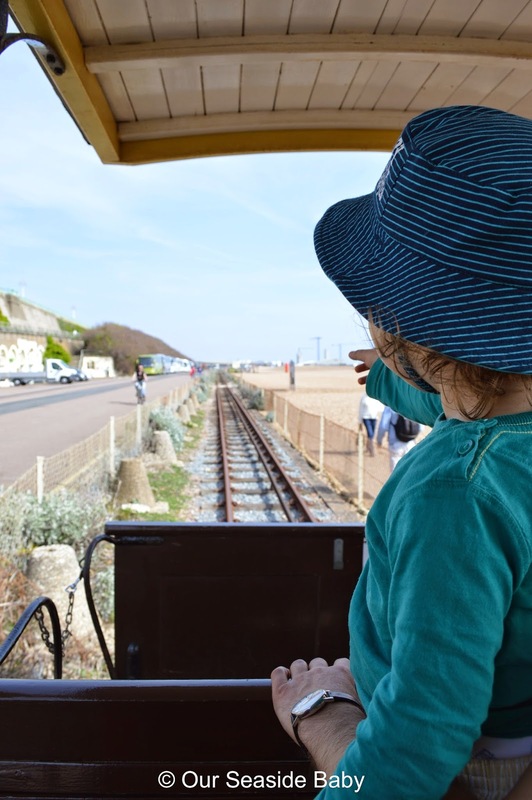 Last week started off with lots of sunshine and a trip on the Volk’s Electric Railway. 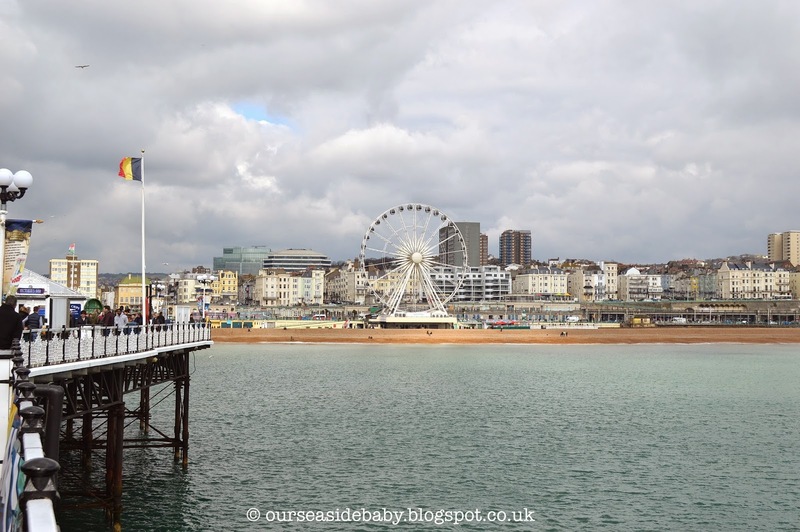 It’s a little electric train that runs from the Brighton pier to the marina. The weather was gorgeous that day, we sat on the beach beforehand with Toddler wearing his brand new and first pair of green crocs! He looks great in them and they are super practical on the pebbles. I will write about the train trip in detail in a separate post. I'll just say that we had never been on and Toddler absolutely loved it. This week the weather has been absolutely gorgeous, so warm and sunny. 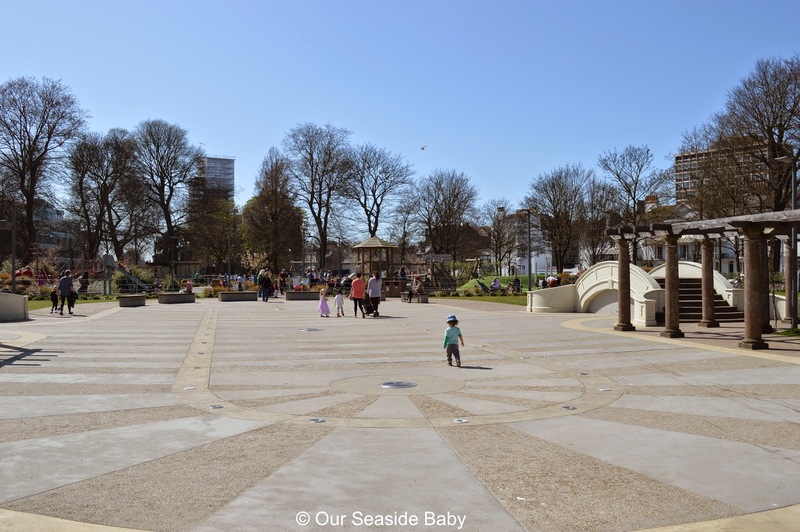 We have been to the seaside, to the park a couple of times and to playgroup. I met up with a mummy friend and her little girl who we hadn't seen in ages. Toddler and her have known each other since they were born and are so in love so there were lots of cuddles and kisses. It was so sweet to watch! 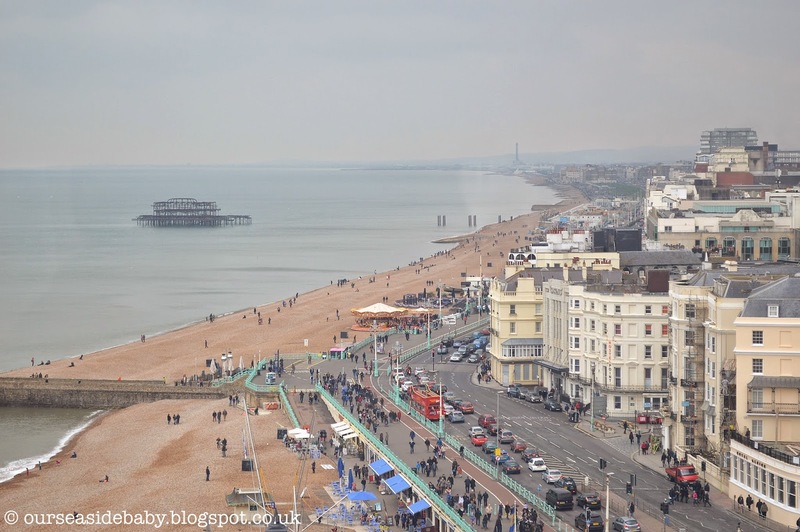 On Wednesday I went to a bloggers event at the Great Expectations shop in Brighton, an independent boutique selling baby & toddler products including a great selection of buggies, carseats and baby carriers. The store has just had a lovely refit so I went to look at their new stock and chat to the other bloggers including Lauren from Belle Du Brighton and Chelle from The Mumington Post. Got stuck on a bus forever in bad traffic on the way to meet a friend. We then went down to the coast only to find fog like no other! 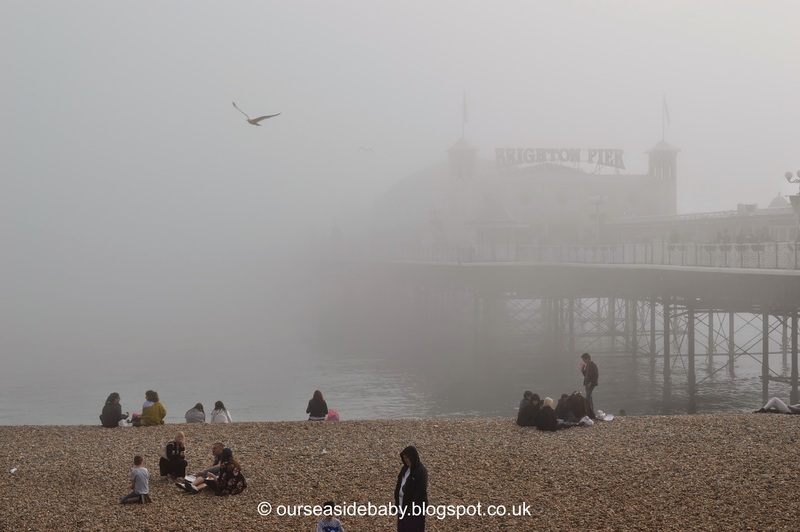 It was very strange and quite eerie, barely being able to see the pier and not even the sea at times! 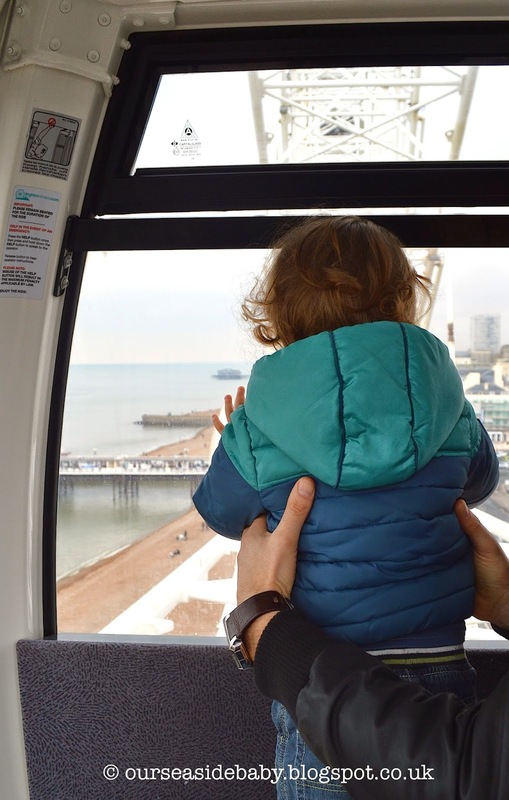 Last weekend we went for a ride on the Brighton Wheel. 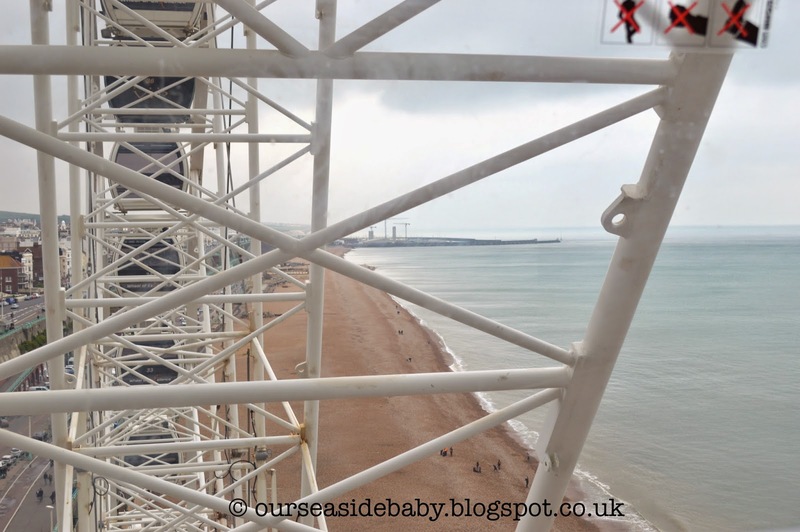 Having been to so many of Brighton’s landmarks this was one thing we had yet to experience. 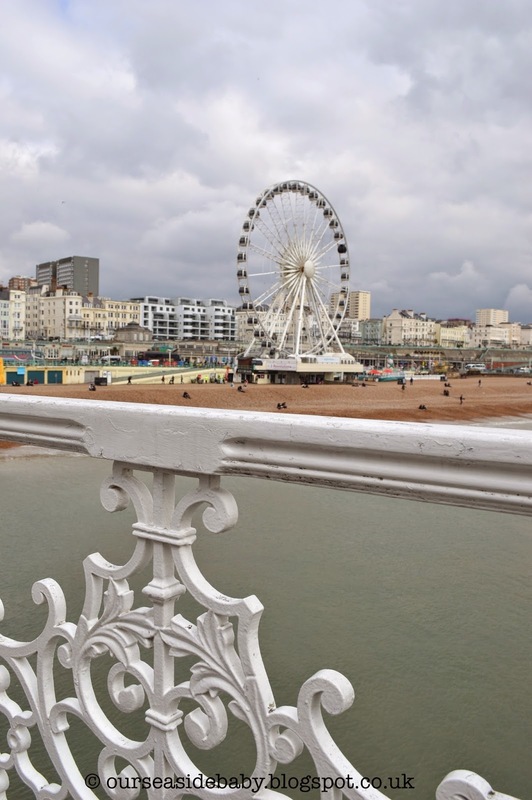 Situated right next to the pier, the wheel was erected in 2011 so is a relatively new feature in the town. It was a cloudy day and I wasn’t too sure if that would hinder our experience but I’m pleased to say it didn’t at all! I also wasn’t sure if toddler would enjoy it. He’s nearly two and at his age some things can be a bit hit and miss. I thought he might find it a tad scary but he loved it up there. 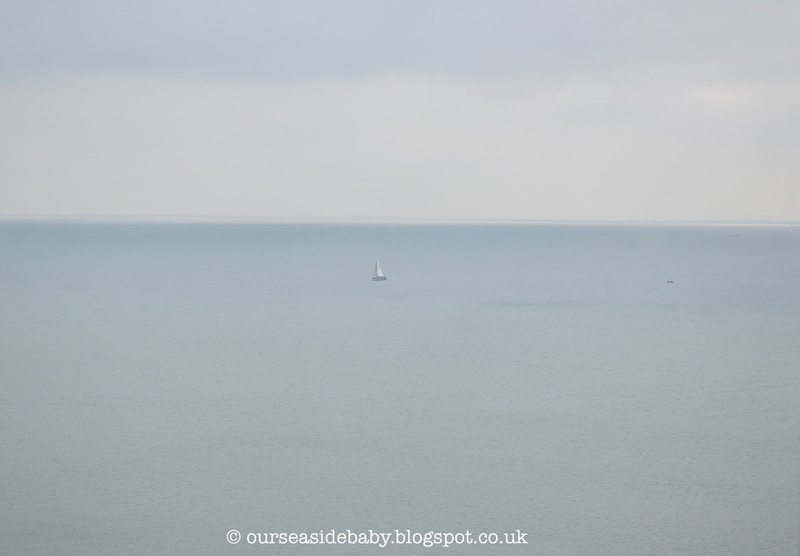 He loves the sea anyway - he’s actually becoming quite obsessed with visiting the seaside and mentions the word ‘seeeeaaaaaa’ several times a day - so getting an amazing view across the ocean was a big treat for him. Here are some photos of the ride. When entering the capsule a photographer takes your photo so you feel like a VIP! Once inside I was surprised at how much space there is. From a distance, the capsules look quite small but can actually fit six adults in so with three of us there was plenty of room. With commentary and air conditioning, each capsule rotates fully at least three times round the wheel and rises 50 meters above sea level. 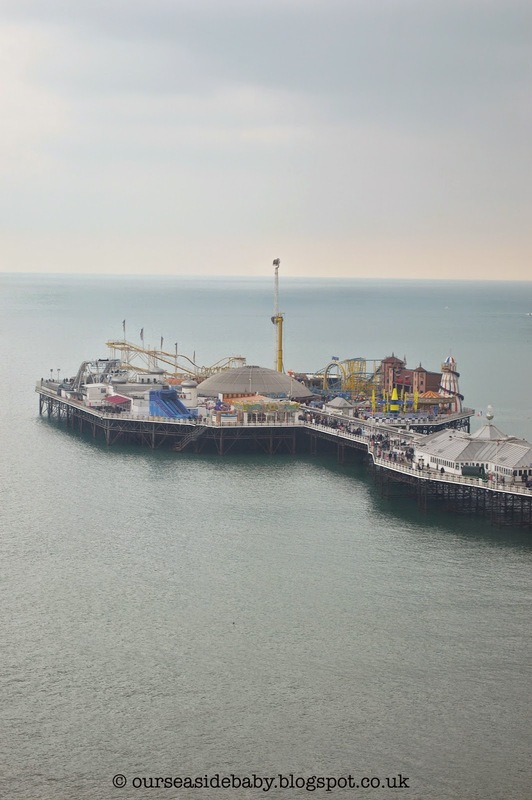 It was a busy Saturday and from the wheel you could hear the sounds of people and fair rides coming from the pier. 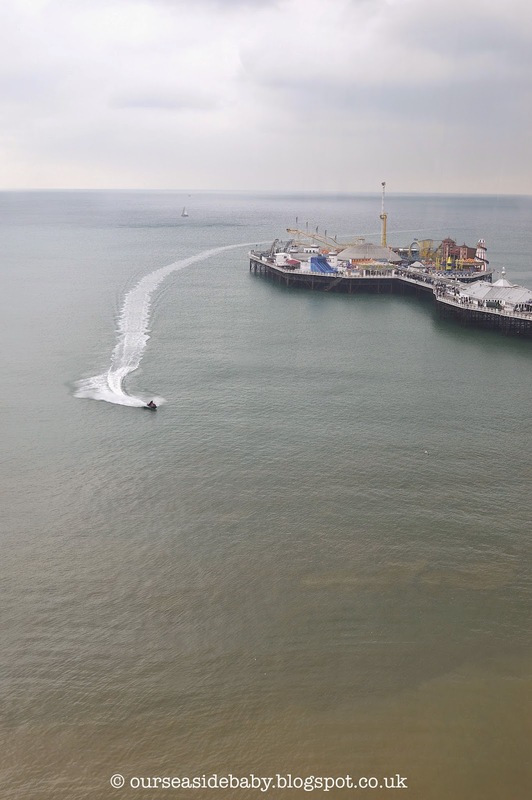 The photo above shows the end of the pier and some of the daring rides that people venture on! 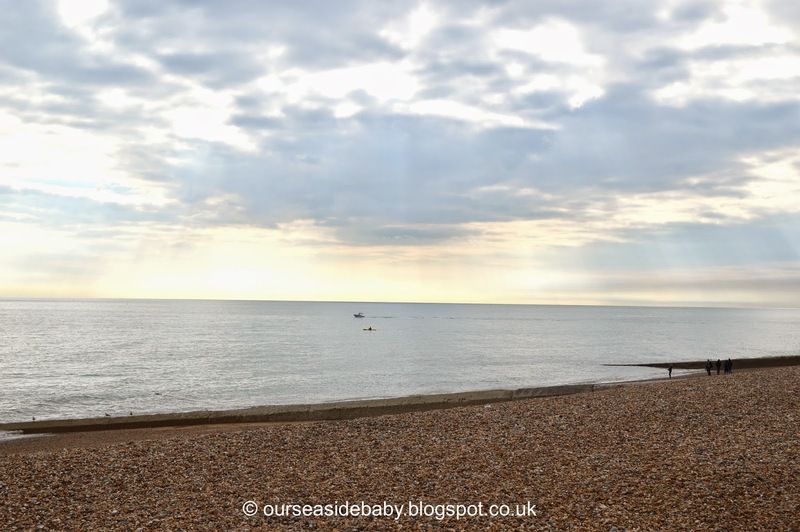 Toddler enjoyed looking out to sea and was very excited to see so many pebbles from afar! I had read some reviews prior to our visit with some stating that there wasn't much to see apart from the sea. For me, that was the biggest highlight! At the top, the sea looked amazing and, of course, much bigger than it usually does from shore, a view I could look at for hours. 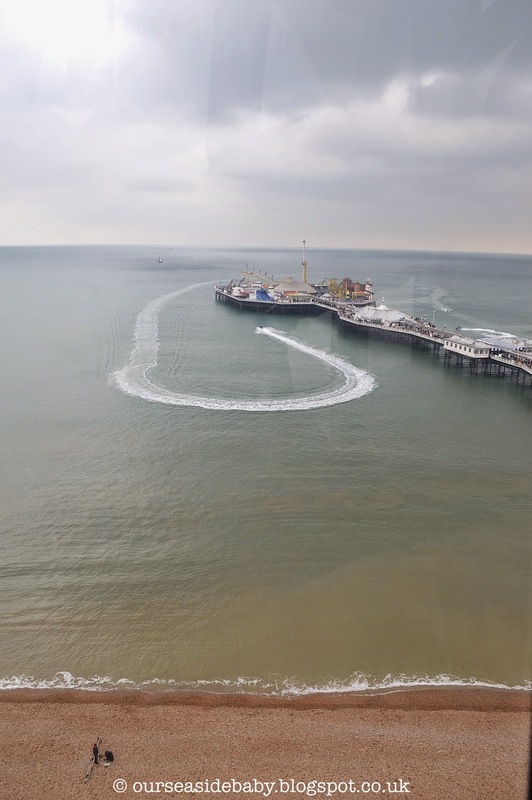 Seeing an aerial view of the pier was pretty spectacular as you get a better perspective of how long and big Brighton Pier actually is! There were some wonderful views of the West Pier and, in the far distance, Shoreham Power Station facing west and the marina and cliffs of the Seven Sisters facing east. 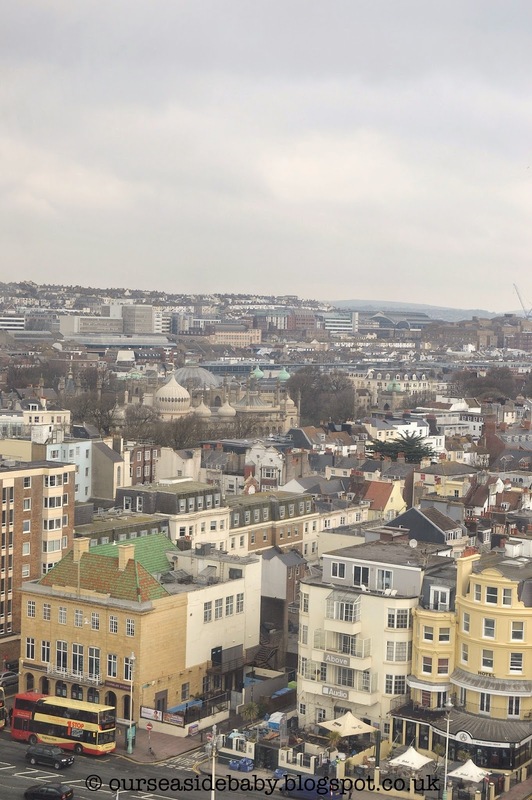 It was also nice spotting other landmarks such as the Royal Pavilion and the South Downs in the distance. A speed boat decided to do a loop around the pier, something that toddler was fascinated by. 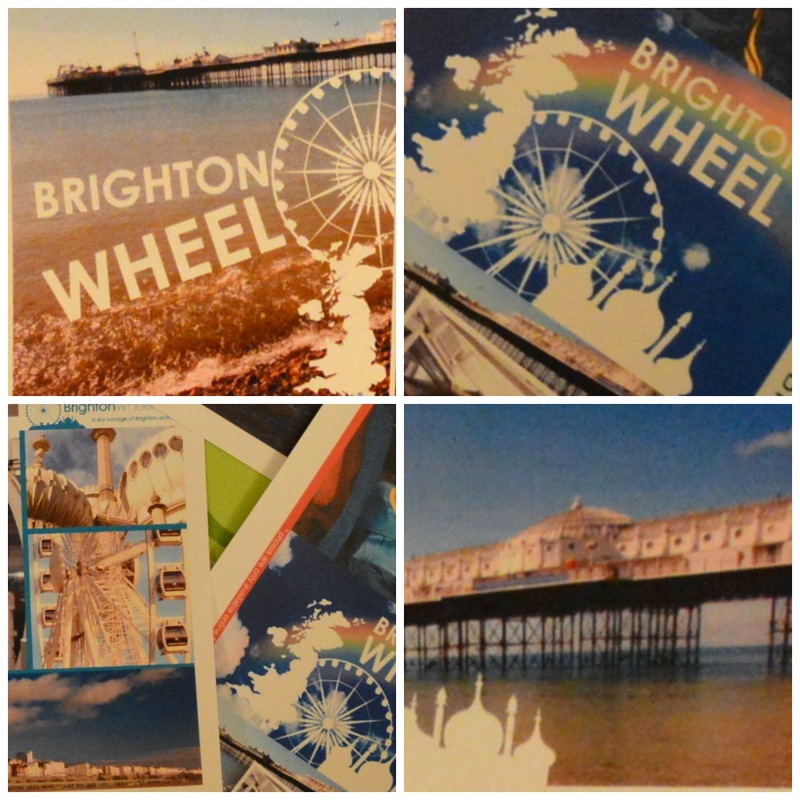 When leaving the photos that had been taken prior to our ride had been turned into a series of postcards, a magnet and keyring complete with a Brighton souvenir guide. 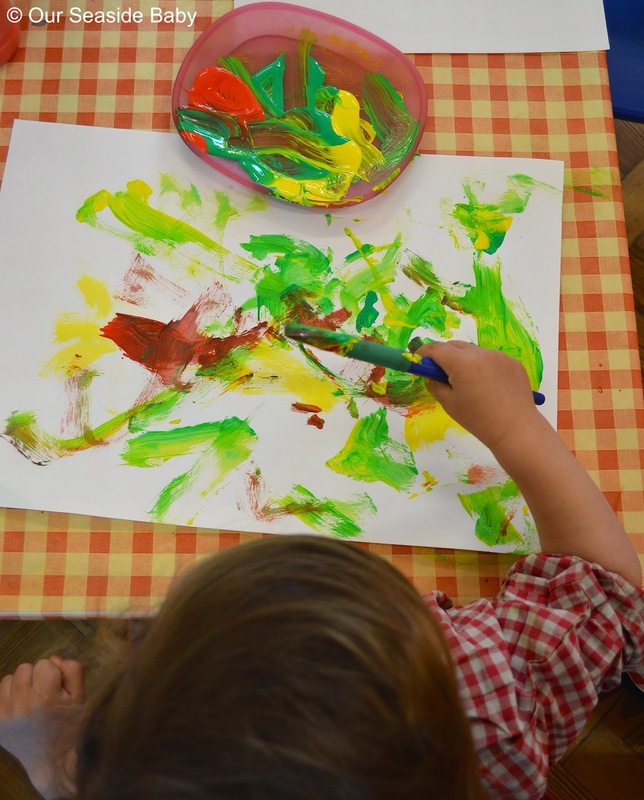 A close up of toddler dominated the postcards with a series of colourful illustrations of the wheel. 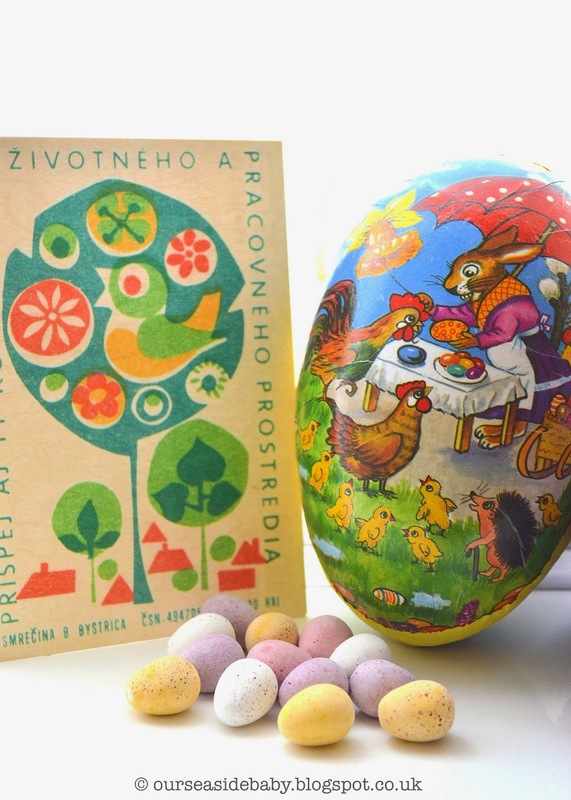 It's a lovely little momento of the trip. One of the postcards is now on the fridge door with toddler pointing to it every morning saying ‘wheeeeeel'! 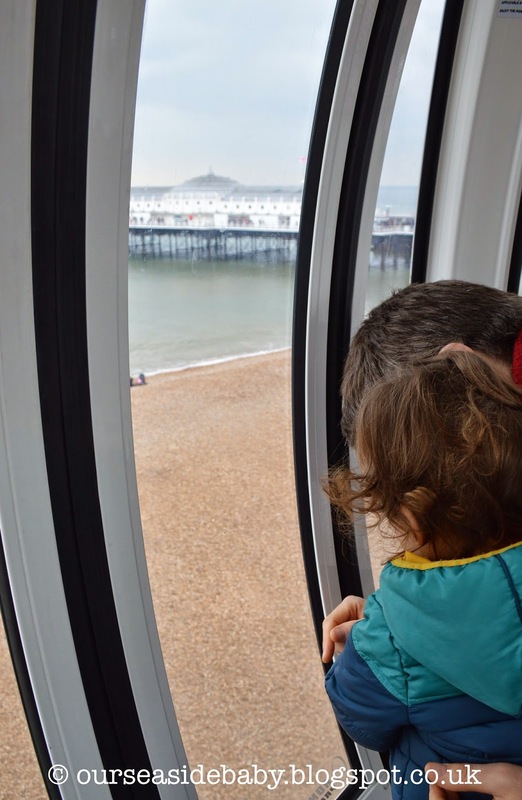 Have you been on the Brighton Wheel? What was your experience? What are the landmarks in your town? 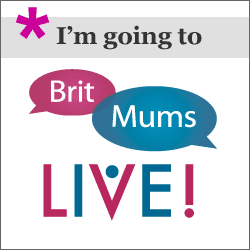 My first blogging conference: I’m going to BritMums Live! I’ve been blogging for nearly seven months and have learnt so much about blogging; discovering the huge community of bloggers out there that I had no idea existed, the opportunities that have arisen from blogging, the feeling of satisfaction of writing and publishing a post, the interaction and lovely feedback, the list goes on and on. 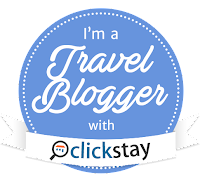 Attending one of the biggest blogging conferences in the year will make me feel even more involved and part of the blogging community. Having read so many blogs and ‘chatted’ to so many bloggers online, mostly on twitter and facebook, it will be wonderful to meet these bloggers in person. I was just thinking today I will probably be quite starstruck meeting some of the bigger and popular bloggers whose blogs I read regularly! Since I started blogging in September I have been writing anonymously, without names or photos of myself and only the back shots of toddler. 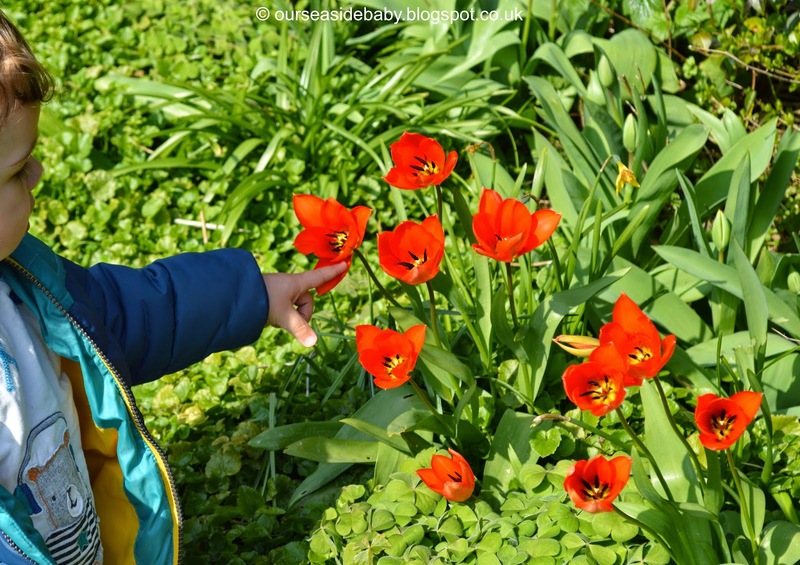 I wasn't too sure about blogging let alone putting a photo out there for everyone to see however, I mentioned in my six months of blogging post that I was thinking about adding some photos. So here they are, eek! It's actually been really good fun blogging anonymously and definitely beneficial. I told very few people about my blog at the beginning and it gave me the freedom to write about anything I chose and to feel that I could write freely if I wanted to. 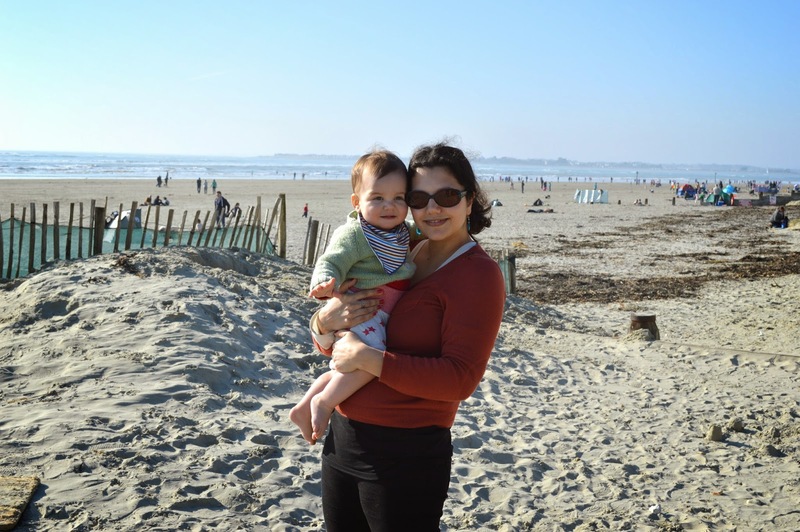 I'm quite a private person and while I don't mind expressing my views and thoughts, sharing photos of me, and especially my little boy, is quite a big thing. Still, only a handful of friends know about this blog. 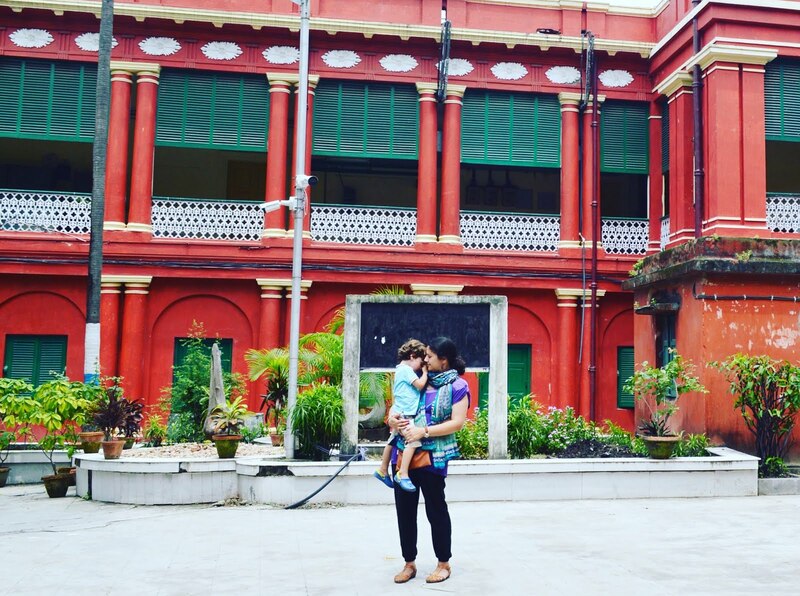 Now though, having worked with brands and attended blogging events, sometimes with my little boy, I am meeting more bloggers in person. 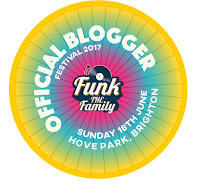 I am also attending my first blogging conference, BritMums in June and realised that no-one would recognise me without a photo! 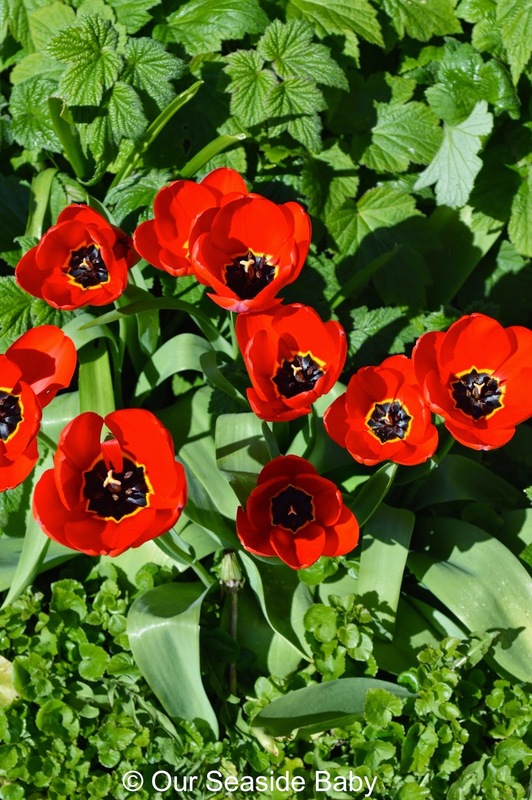 To be honest, I am surprised I have so many readers without showing any photographs as I do love viewing family photos on other blogs. 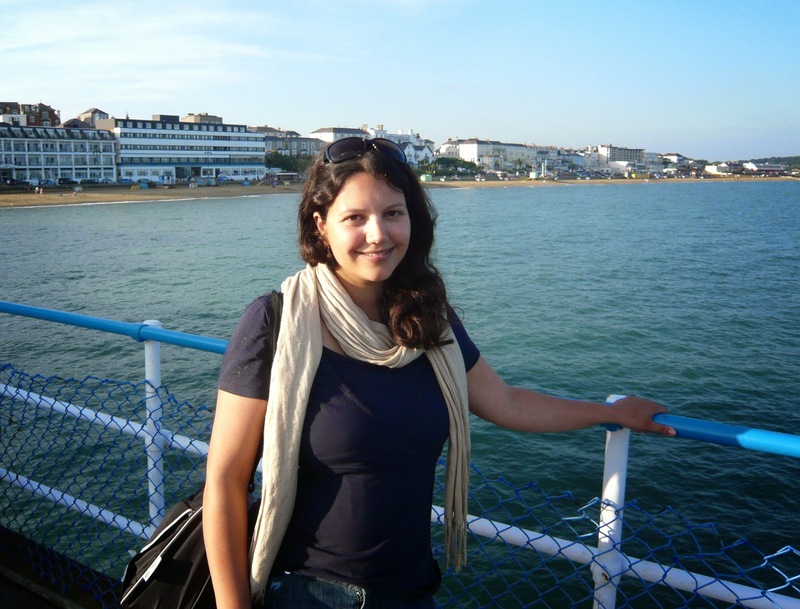 I guess it shows that it really doesn't matter what the person looks like, it's the voice behind the blog that counts! I hope though that any of my regular readers (if there are any haha) can feel a little more connected to me now, in some way. It took a while to find some decent photographs though! 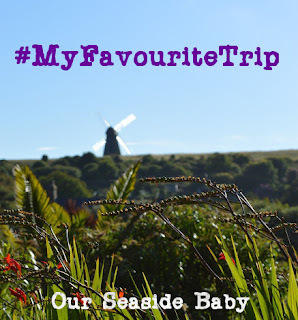 As he's 'our seaside baby' I wanted to find a good one on the beach. As I mentioned before, my name is Polly but I think I will still keep toddler's name hidden, for now at least. Here's a photo of him from last year, isn't he a cutie :) If you're going to BritMums and see me, please come and say hello, I'd love to meet you. 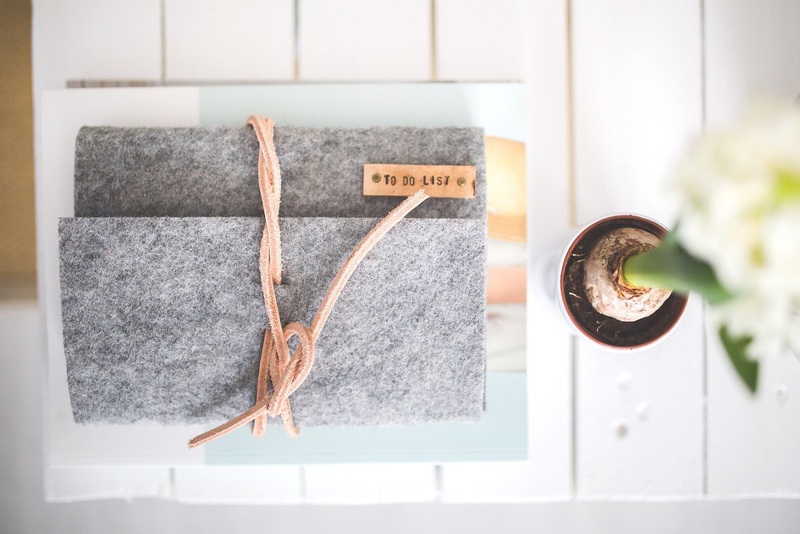 How much information do you share on your blog? 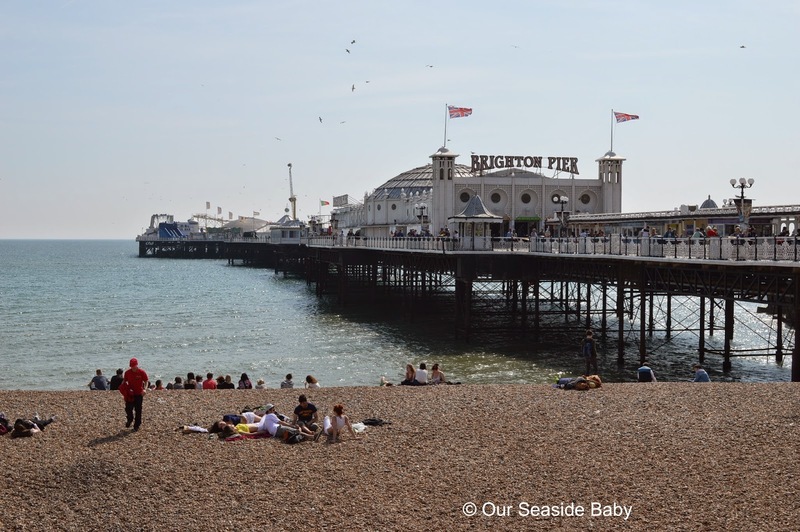 Are you going to Britmums?